We love watching the VeggieTales videos on streaming video through our Netflix and Amazon accounts, but there is one DVD that we opt to purchase to keep each year -- the Christmas DVD! 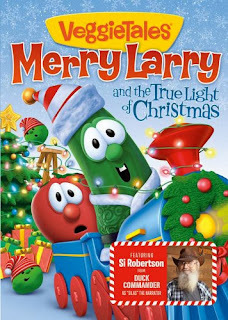 This year, my whole family was super excited to watch 2013's holiday VeggieTales movie: Merry Larry and the True Light of Christmas. Why? It was narrated by an all new character, Silas, voiced by Duck Dynasty's Si Robertson! My kids are huge fans of Si; they have t-shirts featuring him and often repeat his crazy quotes. His added touch this this film made it all the more fun. It also features a great new song by Owl City, featuring Toby Mac called "Light of Christmas." Both the narrator and song were just finishing touches, however. The real gem was the story of this video, where a mall is being decorated for the holiday season. But will it miss the whole point of what the true "light" of the holiday really is? Kids will get a nice reminder of "The Reason for the Season" in a non-preachy, comical, and adventurous way. We will happily add this new DVD to our seasonal collection! You can buy it in time for the holidays at Amazon.com* and other DVD retailers. Wanna Win? We have a 2nd copy of the DVD to send a lucky reader. To be entered to win, just tell us what you treasure most about this holiday season. You have until November 27th at 11:59 pm CST to get your entries in. One entry per person, please. Giveaway is open to U.S. 18+ only. Full promotional rules here. *Sample received to review. Opinions are 100% our own. Links to retailers may contain affiliate links.